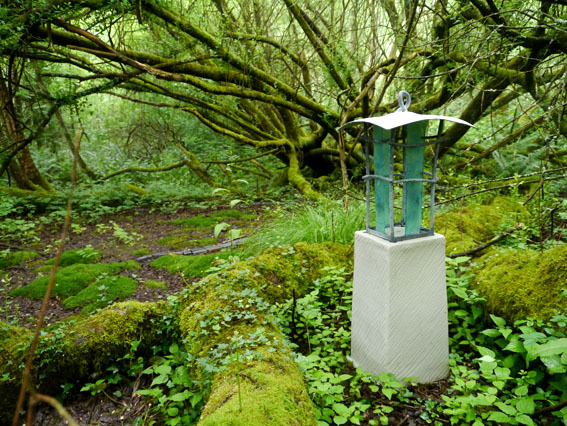 Little Forest Land Art was started in early 2017 by ceramicist Jan Griffiths and artist Adrian Mundy on land surrounding Jan’s studio in the Hampshire countryside. 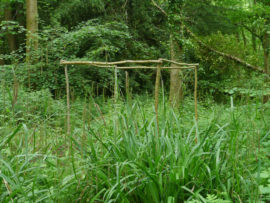 Turning the meadow and surrounding woodland into a place for artwork, focusing on Art in the Garden in early June. 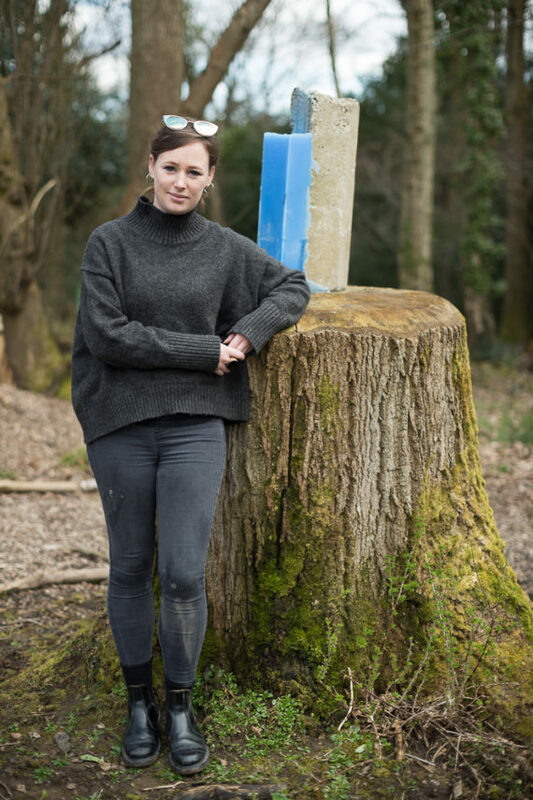 I have always wanted to tap into outdoor sculpture, and being able to exhibit my work on Hampshire’s very own 4th Plinth has provided me with the perfect platform to showcase my work in a new setting and environment. 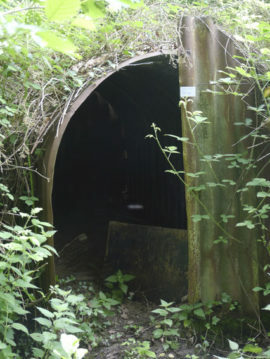 The bright blue wax contrasting against the surrounding greenery has slowly faded in the sunlight, and cracks have begun to appear, through rainwater filling the small well at the top of the wax, freezing and melting. This relates back to the buildings from which my work takes inspiration, many Brutalist buildings are neglected and left to slowly decompose, resulting in them looking slightly unkempt. In this particular piece, I’ve cast the wax onto the concrete to resemble and mimic a city skyline/silhouette. The pop of bright blue wax represents interventions of colour within urban landscapes and surroundings such as graffiti, cladding and signage. This particular piece of concrete has been salvaged, which I believe to be a scrap of road curb. Using no fixtures, this piece may seem somewhat precarious at the same as being evidently solid. In this way, I am continuing my investigations into Brutalist architecture – sculptural buildings that have often generated strong opposing feelings of disdain or delight from urban residents. The combination of man-made materials and natural surroundings, this piece is almost a comment on how nature is being taken over by high rise and concrete structures. I have also been asked to be a judge for next year’s Boarhunt 4th Plinth competition and I am excited to see the possibilities. I would highly recommend applying! The support from the Little Forest team has been fantastic, and having the privilege to showcase my work in such a tranquil setting alongside local talent is really special. 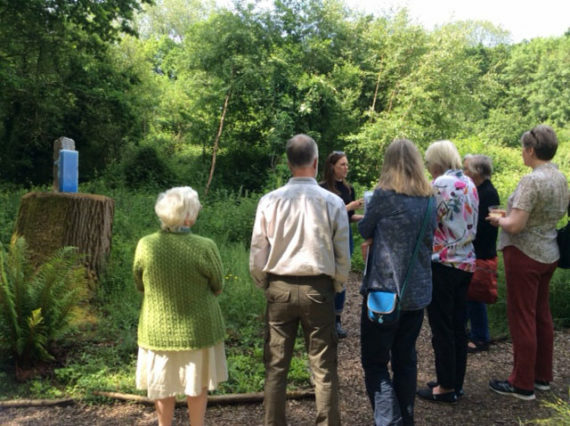 I have also thoroughly enjoyed having the opportunity to discuss and explain my practice and thought processes with visitors to Little Forest through a series of ‘meet the maker’ talks. I don’t think it’s immediately obvious what you are presented with and this has allowed me to open up a whole new way of looking at my work and making it more accessible. Also exhibiting so close to my hometown has been a real milestone for me as all my previous exhibitions have been based in the West Midlands. 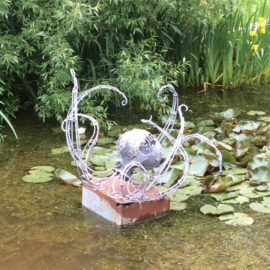 You can view Abigail’s work during Art in the Garden, 10am-5pm daily until 16th June, 2018. This is also a great opportunity to view the site if you are thinking about entering the Boarhunt 4th Plinth competition next year. 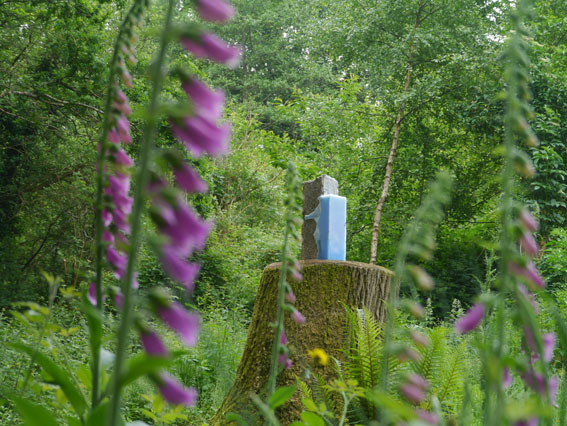 We will be launching the competition, to find an artwork to go on the Plinth during Art in the Garden 2019, in the autumn. 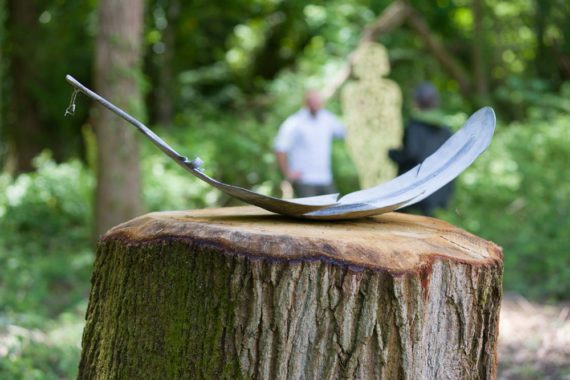 I can not recommend Art in the Garden 2018 highly enough… and it’s not because I’ve been heavily involved with it’s creation, site preparations and because I’ve got two artworks included. Evergreen, our host and LFLA co-founder Jan Griffiths’ home, is a wonderful, calming place. Her modest studio, come gallery, overlooks a natural three acre meadow with mown paths cutting through to create numerous possible journeys. All of this is surrounded by majestic trees that make up Little Forest. For two weeks in June this tranquil place is transformed into a glorious celebration of creativity, featuring the works of 16 amazingly varied artists and makers. Some pieces can be clearly seen from the lawn, while others are discovered when you wander along the paths. 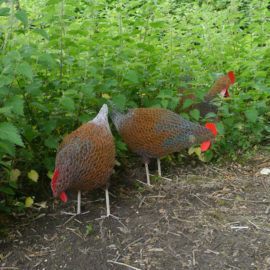 An octopus greets you at the pond, while chickens are ‘pecking’ among the nettles. 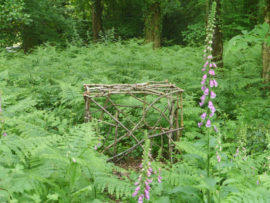 You can wander along the woodland path, under the shade of the trees, and come across the LFLA artists’ work ‘hidden’ in the undergrowth and glorious foxgloves. 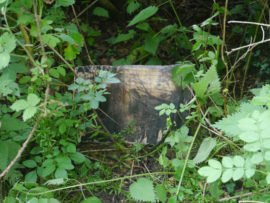 Continue right to the end you arrive at the Pigsty Gallery, an installation of pinhole photography images, transferred on to slices of oak tree, created by our project documentary photographer Duncan Shepherd. Doubling back down the woodland path you come to a clearing where a large oak tree once stood. 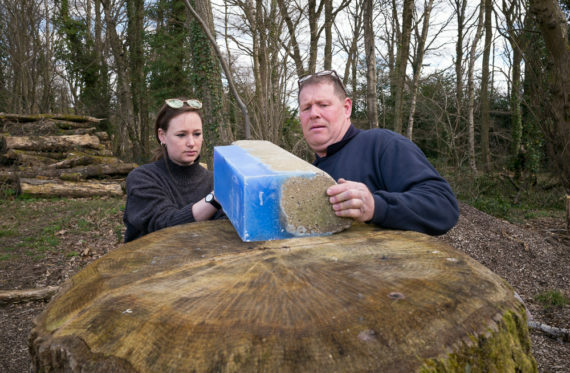 The remaining stump has been created into our Bourhunt 4th Plinth. 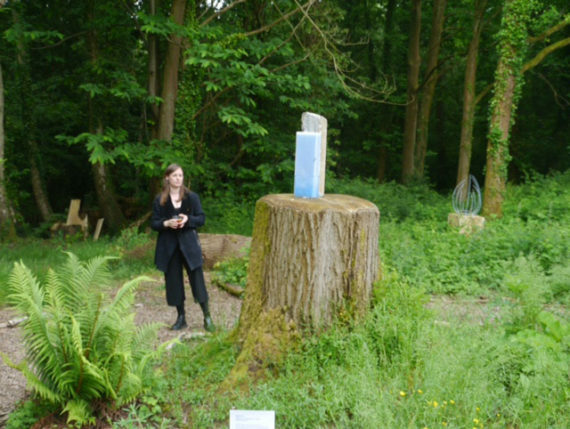 At the end of last year we held a competition to find an artwork to go on the Plinth during Art in the Garden. 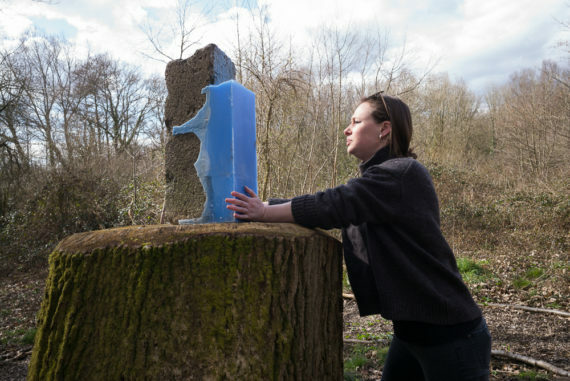 We chose Abigail Day and her striking concrete and casted wax sculpture. Abigail will write a guest blog in a few days. Finally, if you want to get away from everything (don’t worry the mobile phone signal on site is terrible!) then how about a bit of forest bathing under an ancient willow tree. Jan has created a calming, contemplative space for you to sit and clear your head. So grab yourself a cuppa and immerse yourself in a sea of creativity and nature. 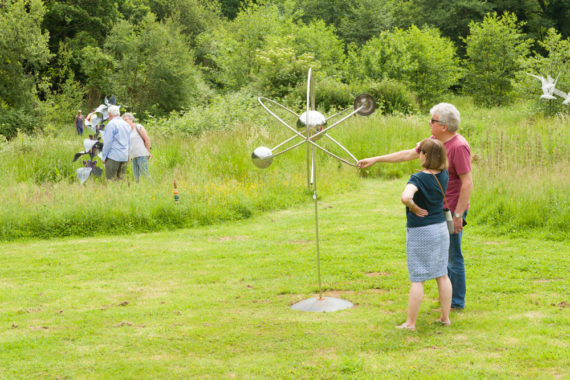 Art in the Garden runs until 16th June, 10am-5pm daily. 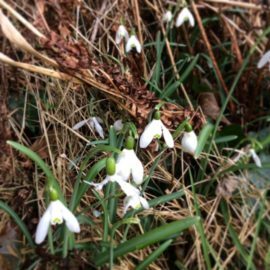 Long winter & a looming deadline! 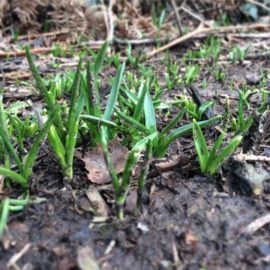 I’m glad to see the end of this winter, and the first signs of spring coming. I haven’t been sitting around feeling too sorry for myself though. We had our Boarhunt 4th Plinth Competition to sort out. Going through all the entries and selecting the winner – details soon. 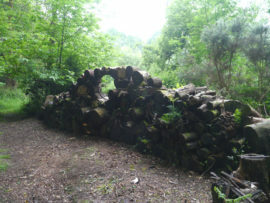 We’ve had a number of onsite days, clearing brambles and making new spaces to show work. The others had me on light duties, taking photographs and tea-making, so I didn’t ware myself out any more than necessary. 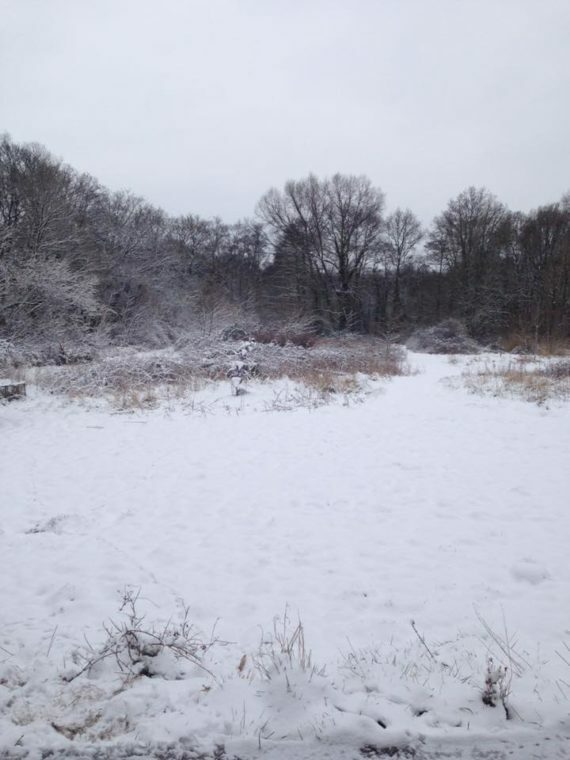 And then there was the snow! It may be a regular occurrence to most of you, but for Portsmouth it is a rarity. I think the last time it laid here was in 2012. Thanks to the ‘Beast from the East’ and ‘mini Beast from the East’ we had a white-out twice. Our host Jan was snowed in both times, which just happened to coincided with planned work days. So we are a bit behind schedule getting ready for ‘Art in the Garden 2018’ 2nd – 16th June. But us artists like a deadline to focus the mind. I’m off to write the press release… after a cuppa. Well, it is 4 o’clock! 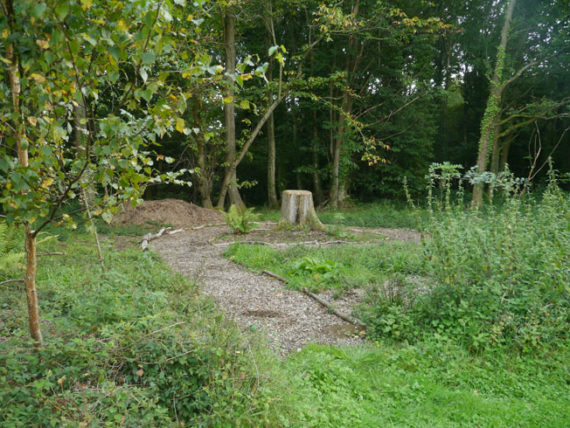 Tomorrow, Saturday 9th December, we have an Open Day for people to find out more about the Little Forest Land Art project. People can also view our ‘Boarhunt 4th Plinth’, the site of our Open Competition that we recently launched (details in the previous post). If you are interested in entering then we strongly recommend that you do view the site so that you can see how it sits in the wider landscape. 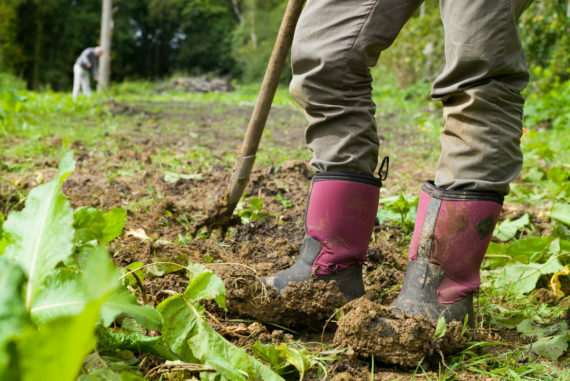 I would suggest bringing wellies or strong shoes as it can get muddy. 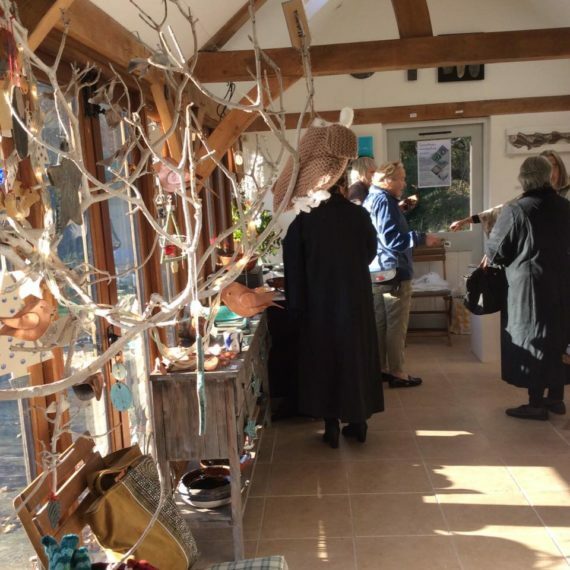 You can also visit Jan’s Making Merry open studio sale with lots of handmade crafts direct from the makers, including ceramics, fused glass, metalwork, handmade books, jewellery, textiles and more. 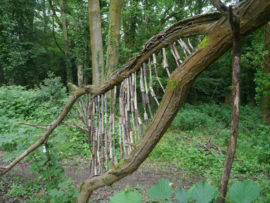 As well as using Little Forest Land Art for our own art projects, another objective was to support other artists and makers. With this is mind we announce our artist opportunity. 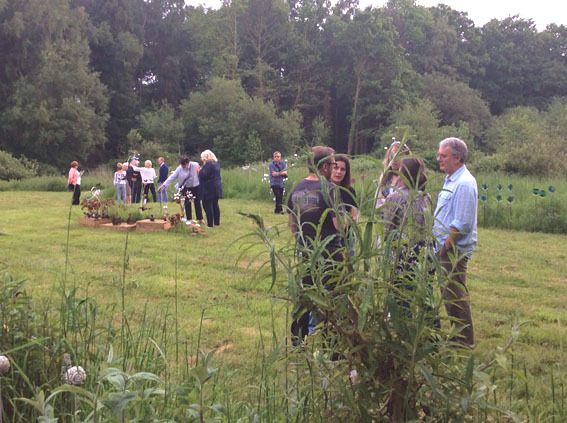 As part of the site preparations a large un-safe oak tree had to be felled. This left the oak stump and a big open space. 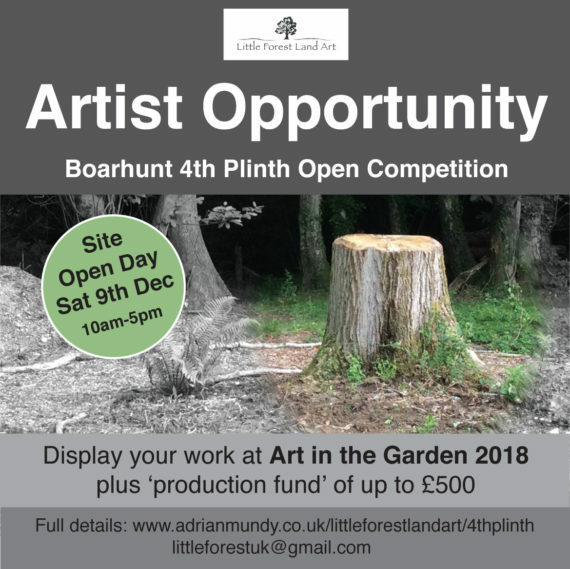 For Art in the Garden 2018 we are looking for an artwork to be shown on what we are calling the Boarhunt 4th Plinth. This could be a new item made specifically for the site or an existing artwork that would look great in this situation. 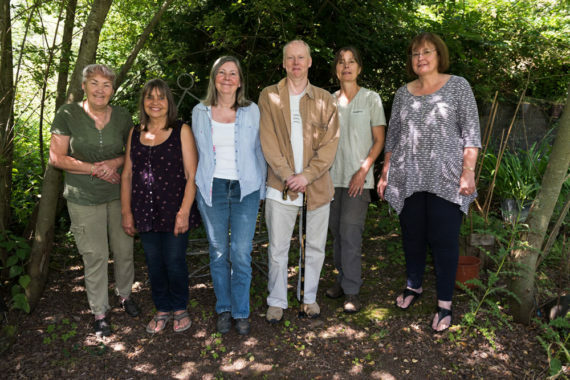 The prize will be to have your work on show during Art in the Garden 2018. You will also receive a ‘production fund’ made up of money from the entry fees. So, the more people that enter the more the winner receives. Minimum amount of £100 up to a maximum of £500. This is an open call to any artist or maker working in any medium, living in Hampshire or the adjoining counties (Isle of Wight, Dorset, Wiltshire, Berkshire, Surrey and Sussex). Entrants must be 18 years of age or over and includes students. The entrance fee is £10 per submission with a maximum of two submissions. Please go to our Eventbrite page to make your payment. as well as Jan Griffiths and myself. We know this is not the normal ‘white box’ venue so you may want to see how the Plinth fits into the wider area, how people will approach it, etc. We are holding a dedicated open day on Saturday 9th December 2017, 10am-5pm so that you can view the site to help inform your work. You can also view the site during Jan’s Making Merry open studio Christmas sale, 2nd – 10th December, 10am – 5pm. There will be lots of lovely ceramic, glass, metal, textile and paper things to buy. or email [email protected] and I will send them to you. Sign up to our social media channels to get the latest news and reminders.